You don't need a professional-grade lab or a science degree to mess around with microorganisms. A small group of New York-based biotechnology enthusiasts have created their own community biology lab called Genspace, and it's a place where anyone who's even remotely interested in life sciences can go and get their feet wet with biotechnology. DIY biologists mainly work from home on their own little cultured experiments. 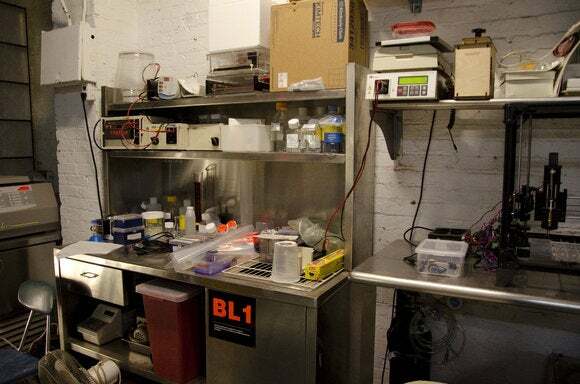 For the most part, this underground biohacking scene regularly communicates through the Web on the DIYbio forums to ask for advice and equipment, as well as to set up in-person meetups. But a growing number of biohacking spaces, such as Genspace and Biocurious in the San Francisco Bay Area, give biohackers proper laboratories to work on their projects. It’s not impossible to assemble your own lab. Genspace, located on Flatbush Avenue in Brooklyn, is the first and only community biolab in New York City. The lab is on the 7th floor of an old bank building: Once you step off the elevator, turn left, and you’ll stumble into a scene that looks like your middle school's science department, except it’s all grown up. The main work room is a little grungy, between the mess of works-in-progress spread all over the table, the painted brick walls, and the exposed pipes hanging overhead. Beyond this room, however, is a small lab that’s a completely different scene. Step into the lab, and the whole place seems brighter and cleaner—and more sterile. Boxes of gloves are scattered about. A lab coat hangs on a stool. Test tubes and other pieces of lab equipment litter the stainless steel countertops. A stack of petri dishes fester with microscopic life that comes in every color of the rainbow from violet to red. Meanwhile, the scent of chicken broth hangs in the air—it's just about the closest I can come to describing the smell and appearance of warm bacteria-culturing medium. The whole place just screams, "hey, I'm a lab." The organization's official mission is to promote citizen science and to make biotechnology more readily accessible to the masses. Since it first opened in 2010, Genspace has invited science enthusiasts from all sorts of different professions to play in its biotech wonderland. Some of Genspace's members and supporters are biologists as you might expect, while others are writers, artists, roboticists, and computer programmers. Regardless of the background they hail from, contributors of all stripes are welcome here. What drives someone to biohack? Curiosity. Many of those I met at Genspace just heard about the place, and on a free night decided to stop by to see what DIY biology is all about. For some, it’s just one night of amusement, but for others, it sticks with them—sort of like a virus—and snowballs into a full-on hobby. A hacked-together microscope that's hooked up to a webcam. 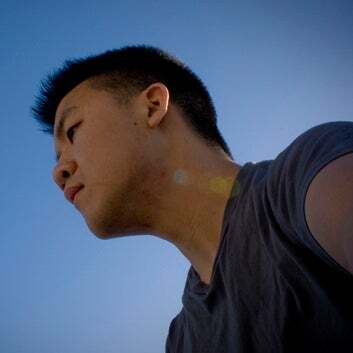 Andres Bastian, a 3D printer mechanics expert at MakerBot, says he was “interested in biological engineering for a long time," and that the relative maturity of biohacking was a big draw for him. "The biological toolset has been something that’s been optimized and honed for a long time. It’s one of the most efficient toolsets, [and it] seems like it can be applied to anything from energy medicine for treating diseases,” Bastian said. Grushkin got into the biohacking scene after witnessing college students assemble their own living organisms at an iGEM biotech competition in 2009. Oliver, a Genspace member, pours out plates of media into petri dishes for bacteria cultures. Smitten, Grushkin took to the online biohacking forums and met others interested in the topic. Soon after, he met with a group from the DIYbio forums at his Park Slope home. The group started with small experiments like extracting DNA from strawberries, and moved on to more advanced projects from there. Eventually, it graduated to creating its first genetic transformation by injecting a membrane with green fluorescent protein (GFP) into E. coli to make it glow in the dark. “[It] was kind of cool and actually controversial because it was the first time someone had done genetic engineering outside of your standard lab,” said Grushkin. The group officially incorporated as Genspace in 2009, and held its initial meetings at NYC Resistor. Genspace officially opened its own space in December 2010. On the evening I visited Genspace, the conversations revolved around Polymerase Chain Reaction (PCR), the biochemistry technique biochemist Kary Mullis originally created in 1983. The process allows you to easily replicate DNA through a thermal-cycling process—that is, you cool then heat the enzymes in DNA over and over again. Since the PCR process was first developed, it’s split off into countless different variants, and most famously has allowed for DNA identification in police forensics. This is one of Genspace's regular PCR and Pizza events: It's a laid-back gathering where Genspace members get together and discuss their latest projects. And best of all, it's open to the general public. DNAquiris are literal DNA cocktails. Genspace President Ellen Jorgensen introduced all of us to the DNAquiri (get it?). 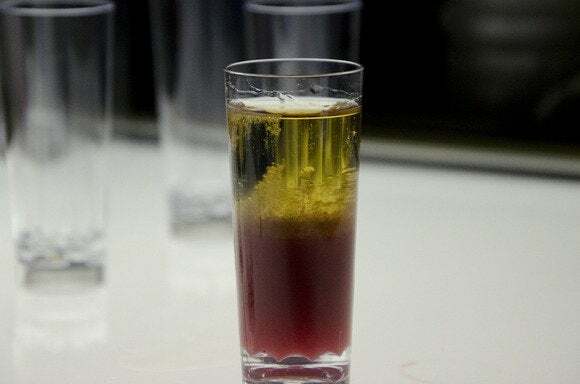 It's a simple experiment you can try out at home—assuming you are of legal drinking age, anyway: It’s equal parts drinks mixology and science, and it lets you pull the DNA out of strawberries, see it, and of course, drink it. It’s fairly simple to make, too: Just mash up a bunch of strawberries, mix in some pineapple juice, and add Bacardi’s 151 hard rum chaser (that’s about 70 percent alcohol content—science does not mess around!). Once you put it all together, you can watch the strawberry DNA simply rise to the top and collect it if you so choose. Congratulations, you’ve just completed your first biohacking experiment! Scientists and random walk-ins alike discuss their biochemistry experiments. Since its founding, the biohacking lab has matured into a full-on institution. Genspace holds regular events and classes that cover a wide range of subjects, like a Biotechnology Crash Course, a class on Barcoding DNA, and a discussion on the environmental effects of releasing a lab-made species into the wild. Biohacking isn't for those with tight wallets, though. While some events are free, like the PCR and Pizza get-together I attended, regular access to Genspace requires a membership that costs $100 a month. Members get to access the space whenever they want, and membership also includes safety training, access to all the equipment you know how to use, and full freedom to pursue any projects you want as long as they’re deemed safe. One of Genspace's smaller lab work areas. Note the orange "BL1" sign. Even with a space as inviting and open as Genspace, Grushkin acknowledges that safety can be a concern when you're playing with biological agents. Obviously, having a group of DIYers experimenting with viruses outside of a traditional institution or research lab is going to raise a few eyebrows—especially in Washington, D.C. But it’s too easy to fall into the idea that some individual may inadvertently (or purposely) create a world-ending, homemade biological weapon. To address these sort of concerns, Genspace strictly adheres to the Biosafety Level 1 (BL1) guidelines put forth by the US Centers for Disease Control. Under these restrictions, Genspace members can't work on any projects involving organisms that could be harmful or pathogenic to humans. So to be absolutely clear: No one at Genspace can work on human cancer cells, the HIV virus, or anything that could be passed on to other people. Even during the early days of Genspace, the founding members contacted law enforcement officials first to let them know what DIY biology was and what they were doing. The scene at one of the PCR and Pizza events. Grushkin says that biohacking spaces like Genspace can actually help dissuade the fears about a group of enthusiasts working on bacteria, and at the same time makes biotechnology much more approachable to the general public. Serratia Marcescens, a bacteria that grows on bread, is used as bacterial red paint. If there’s one thing I learned about DIY biology, it’s that you don’t need to be a scientist to jump in. While at Genspace, I met Sarah Choukah, a New York transplant originating from Montreal. Choukah is communications student who took part in the 2012 iGEM competition and decided to join Genspace as a member soon after. Sarah joked that Genspace was actually a place that made her consider going back to school to study science. Sarah was hard at work on a biosemiotics project to use living cells as a form of communication. At the same time, she was helping another Genspace member set up a makeshift microscope using webcams to observe paramecium. But that’s not all—the biohackers also paired an Arduino microcontroller to a Lego-encased joystick controller to control the direction in which the paramecium moves. This Lego-assembled controller tells the paramecium what to do. One of the lab's more outlandish experiments is an ongoing DIY neuroscience project to control mice brains using optogenetics, a combination of genetics and laser light used to control brain activity. Oliver also spoke of a living watch—with a band made of chemically grown “victimless leather”—that keeps time using the natural oscillation of a microorganism. Meanwhile, Grushkin mentioned that some members are currently researching "bio-crete," a form of self-healing concrete. Genspace President Ellen Jorgensen helps a fellow biochemist. According to Genspace President Ellen Jorgensen, the lab's next big plan is to expand the educational support it already provides to high school and junior high school students through internships. With some additional funding, Genspace wants to hire full-time teachers, which will allow it to put on additional mentorship programs led by PhD scientists—something that isn't possible with Genspace’s current volunteer staff of instructors. More importantly, Genspace is able to serve as an independent scientific space that doesn't need funding from a school, institution, or company. Genspace member Nelson Ramon built this anaerobic glove box. 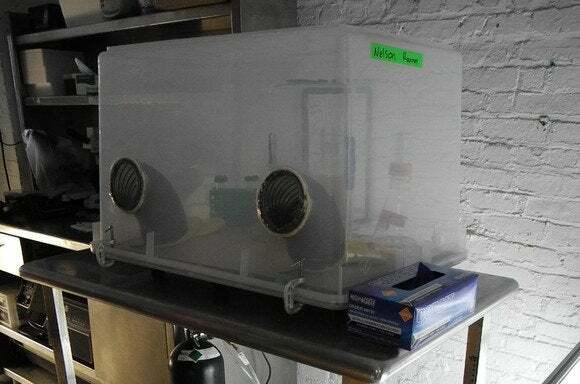 In addition to DIY biochemistry projects, the lab has also produced plenty of self-built equipment, including a DIY Anaerobic Glove Box for handling samples that need to be kept out of oxygen. Jorgensen explained that by reverse engineering lab equipment, Genspace members are not only helping themselves—they may also be helping educators from around the world that lack the resources to run a fully equipped laboratory. Scientists support the DIY biolab approach, too. “Scientists actually like it because everyone dreams of a space where you don’t have to justify what [experiments] you are doing to some committee that decides whether its worthwhile or not based on if it’s going to make money,” Jorgensen said. If you’re part of the biohacking community—or are just itching to get in—you can expect to see Genspace at the upcoming iGEM 2013 competition. Or just come on down to one of its PCR and Pizza nights. This story, "DIY biohackers play with bacteria at Genspace, a community science lab" was originally published by TechHive.